Washington, DC—I can’t imagine that anyone was really that stupid to believe this pretender’s claims to never raise taxes. 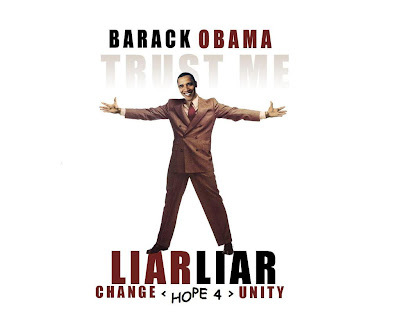 Barack Obama did what all crooked politicians do best; lie to the voters just to get elected. Obama has been closely following the Marxist playbook; Das Kapatal and can only succeed with his government model with a totally dependent and impoverished population. Marxists judge their success on how well they keep their population orderly and silent through heavy handed police state tactics. We all know that with Obama’s non-stop bailouts, massive efforts to end free enterprise, cap and trade scam, the hostile takeover of the health care and insurance industries enormous tax increases would enslave every American. It is time to rid ourselves of this fraudulent President and start over. Polls show many Americans that voted for him, are now remorseful. Obama is well past the point of no return before he completed the first year of his term. In case you missed it watch this despot as he repeats his campaign lie. my goodness the sheeple were stupid, and I am now glad they are having buyers remorse. Too little too late for those of us that saw right through his crap........ But it will guarantee he won't see a second term in office. Scratch that, lets hope someone gets him and his sack of fools impeached. Hey Mr.Transparency,explain Executive Order #13489?? Also,why wont you and your family adopt the new Universal health care you are pushing? ?Why are you and Congress keeping your "special" health care program?